Bluebell Cottage is a South facing, bright and comfortably furnished, ground floor accommodation. There is off road parking for 2 cars and an enclosed grassed garden to the front with beautiful open views. 1/2 a mile away is Pitmedden Forest with many walk/cycle routes and picnic tables. The village of Auchtermuchty is 1/2 a mile away with pubs, shops and cafes. Auchtermuchty was the adopted home for Sir Jimmy Shand MBE, MA who was a famous Scottish accordionist and dance band leader in the 1950/60's. Bluebell Cottage was the music room for Jimmy Shand and is named after his 1955 chart topping hit the "Bluebell Polka". The village has a bronze statue in honour of this late great musician. Today the famous musical talents to come from the village are The Proclaimers. Bathroom bath with shower over, toilet, wash basin in vanity unit, mirror, shaver point, heated towel rail. Lounge with wood burning stove, 2 comfy leather sofas, coffee table, flat screen TV with Freeview, DVD player and radio/ipod docking station. A selection of books, board games and DVDs provided. Well equipped kitchen with large halogen hob, large electric oven and smaller electric oven/grill, fridge/freezer, dishwasher, washing machine, microwave, kettle, toaster, cafeteria and all cooking utensils. Dining area with table seats 4. The cottage is central for may of this area's famous golf courses: The Old Course, St Andrews (20 miles) Gleneagles (24 miles) Carnoustie (33 miles) Also local Golf Courses: Falkland (3 miles) Ladybank (5 miles) There are numerous other courses within easy driving distance. Notes on accommodation: No smoking inside the cottage 2 dogs allowed No dogs in bedrooms Outside: Rear fenced chipped area with rotary drier. South facing fenced front garden with lawn and flower beds, shed to store bikes, BBQ (no coals provided), garden furniture provided. A quite pleasant area for sitting outside to enjoy the views with a coffee or wine. If you are lucky you will see deer, pheasants and other wildlife in the surrounding fields. Cleaning / Towels / Linen / Maid service: All bed linen and towels provided (including beach towels). Linen and towels changed weekly. Other: Travel cot available. High chair available. First basket of logs provided. We enjoyed a perfect stay at this beautiful cottage in Fife. There were lots of local walks and plenty of places to visit within a short drive. Falkland and Loch Leven are must visits. 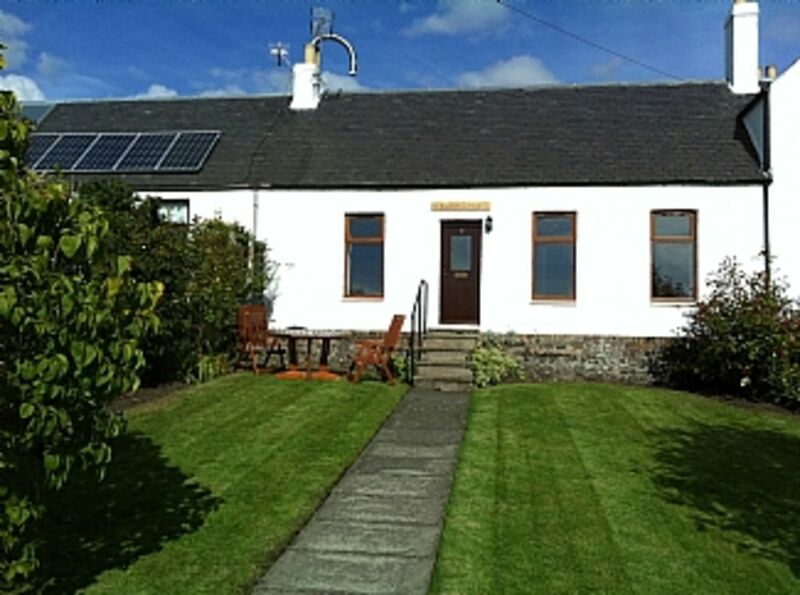 The cottage is equipped to the highest level and was very clean and tidy. We had a great holiday staying in this lovely cottage. It is finished to a high standard and very comfortably furnished. It is equipped with everything you could need and is immaculately clean. The owners next door were welcoming and helpful. Lynn was particularly helpful in watching over our old dog when we went out. The cottage is in a lovely location with great countryside views. It is an ideal base for exploring the lovely Kingdom of Fife. So glad you enjoyed your stay in our cottage Roy. I hope Buddy is well, it was not a problem to keep an eye on him. Staying in this beautiful cottage provided us with an authentic Scottish experience. It is beautifully decorated and anything you might need is provided. Lynne and Mike are friendly , welcoming ,and very helpful. This was our first trip to Scotland. It provided us with a central location for travel. It is an easy walk to the village for dinner, a drink at the local pub, and grocery supplies. If you are a hiker, a forrest with numerous trails is a fun option. We highly recommend this Scottish cottage. Thanks Leroy for your review, glad you enjoyed your stay in our cottage. It was a pleasure to meet you and Kathy and we would welcome you back anytime. Clean and well-supplied cottage with spacious views of rolling fields and hills. Very clean and well supplied cottage with all amenities. Lovely views and local walks. We played 'Bluebell Polka' with guitar and two fiddles to honour Jimmy Shand! Saw red squirrels in the nearby woods, and deer jumping fences. Great cottage, home from home. Lovely and clean, the owners are helpful, and the cottage is all that you expect it to be. As soon as we arrived the cottage felt welcoming and homely with little personal touches, lovely secure garden for the dogs. The village of Auchtermuchty is 1/2 a mile away where you will find pubs, cafes, shops, post office, chemist and doctors and children's playparks. Auchtermuchty has 2 cash dispensing machines but no bank. Bluebell Cottage is an ideal location for outdoor enthusiasts, as you have magnificent countryside right on your door step, a 1/2 mile walk will take you to Pitmedden Forest which has numerous marked walk/cycle ways to explore, with picnic tables on route. The Lomond Hills are only 3 miles away shadowing the historic village of Falkland with it's Royal Palace, listed building's and narrow wynd's. Falkland also has pubs, restaurants, tea rooms, craft/gift shops and an organic farm shop. There is so much to see and do in the area Sea Life Centre in St andrews (30 mins) The Deer Centre near Cupar (15 mins) Deep Sea World in North Queensferry (40 mins). You are also within driving distance of Dundee (40 mins) Edinburgh city centre (1 hr) Pitlochry (50 mins). Auchtermuchty holds a Music Festival yearly in August. Booking Notes: A non-refundable deposit of 50% is required at the time of booking. Provisional bookings are held for 7 days only. The remaining 50% is payable 6 weeks prior to arrival. For bookings made less than 6 weeks before arrival the total amount is payable. We accept payment by Bank Transfer or Cheque. Bookings will be confirmed in writing. Changeover Day: Our preferred changeover day is Saturday during July/August all other times flexible. Arrival from 3pm Departure 10am Notes on prices: Please note when we offer a weekend/short break there is a 3 night minimum stay at £75 per night. Sorry we cannot offer weekend/short breaks in July and August unless we have late availability. Please enquire.